Yes, that's another Noro Silk Garden MD scarf on the needles. I love this pattern, and it's the perfect project for knitting group and marathon sessions of Grey's Anatomy. In other news, there have been some Bigfoot sightings in the Milwaukee area recently -- see here. Much silliness, I know, but we still took Paul's little cousins on a Bigfoot walk after Thanksgiving dinner since we were right near Holy Hill. We didn't have any luck on the Sasqatch front, but we did have a minor scare when a big ol' dog came running out of the woods barking furiously at my cousins' tiny Maltese. A still from a 1960s video of a "Bigfoot sighting"
I came home from Milwaukee to find a Thanksgiving package from my secret pal! She cross-stitched a really cute Thanksgiving-themed bookmark for me that I'm going to put to use right away. No one has ever given me a cross-stitched gift before! I've done a lot of cross-stitching over the years, so I know how much goes into it. She also sent me a very interesting book -- Adventure Divas: Searching the Globe for Women Who Are Changing the World, by Holly Morris. It ties in with a PBS documentary series that Morris and her mother made. It's definitely on the reading list for winter break! 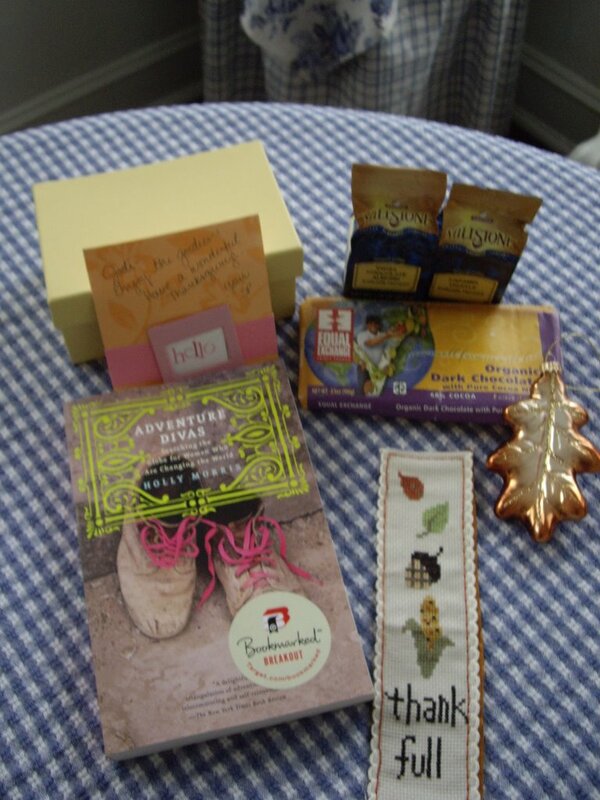 There were other goodies, too: 2 yummy flavored coffees, some wonderful (and SO DARK) Equal Exchange organic chocolate, and a beautiful glass oak leaf ornament. Thanks, SP! 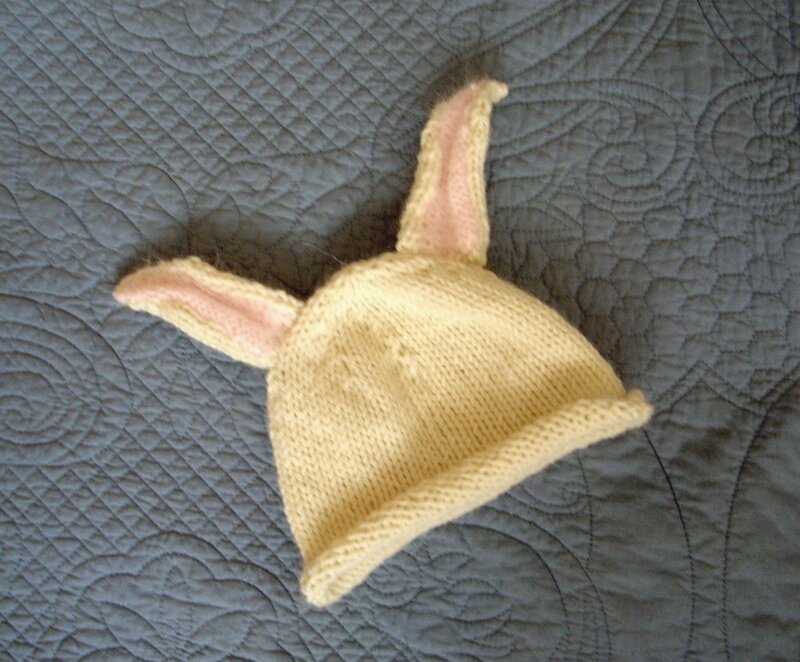 I finished off the bunny beanie on Saturday while at a crafty gathering with some girls from my knitting group. This was such a fun project. I'm tempted to make another right away! 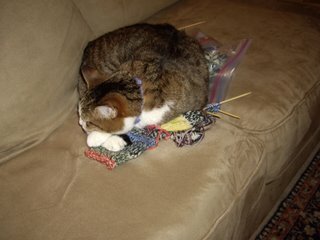 Someone has been napping on my sock-in-progress. Something cute is in the works! Can you guess what I'm up to? I'll post a picture of the finished project when I return from my Thanksgiving trip to exotic Milwaukee, Wisconsin. 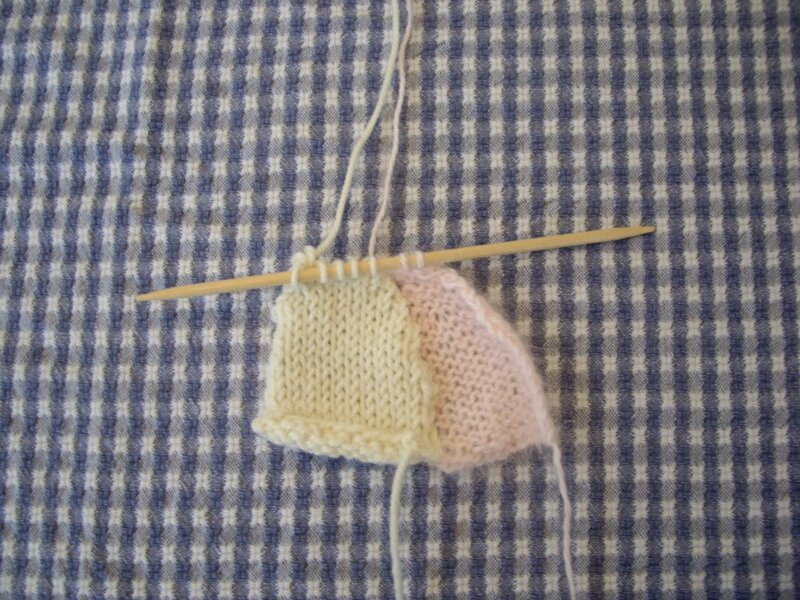 So far this knitting project is the most fun ever. I've been watching season 2 of Grey's Anatomy while working on it, and that is one addicting show. The holiday ornament crafting is in full swing! I redscovered the joys of felt the other day. Felt trees and hearts are in the works, too. I'm thinking of sewing colorful buttons onto the green felt trees. This will require a trip to Joann, of course, but I could probably use some more embroidery floss, too. Sock #1 is almost done, but I'm out of yarn with mere inches to go! I need to pick up some black superwash for a contrasting toe. I already see the benefits of toe-up sock patterns. 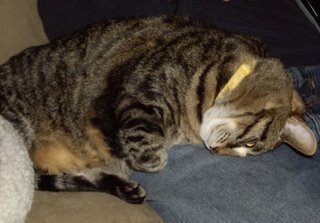 Kylie has been contorting herself into very cute positions lately. Here she is curled up into Paul's lap while he watches football. The birthday party was a success, and the butterscotch bars were a huge hit, as usual. I used a different brand of chocolate chips for the brownies, and it did not go well. Avoid Guittard's extra melty semi-sweet chocolate chips for this recipe. I think the "extra meltiness" ruined the texture. They were too smooth! Normally I like that brand of chocolate chips, but I would stick with the regular semisweet chips for this. The DIY Trunk Show itself was a disappointment on Saturday, but I had a great time hanging out with friends from my knitting group! 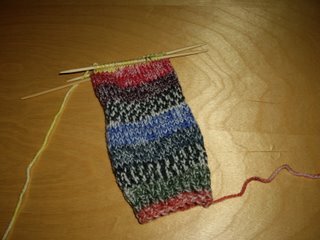 I started my first pair of socks! 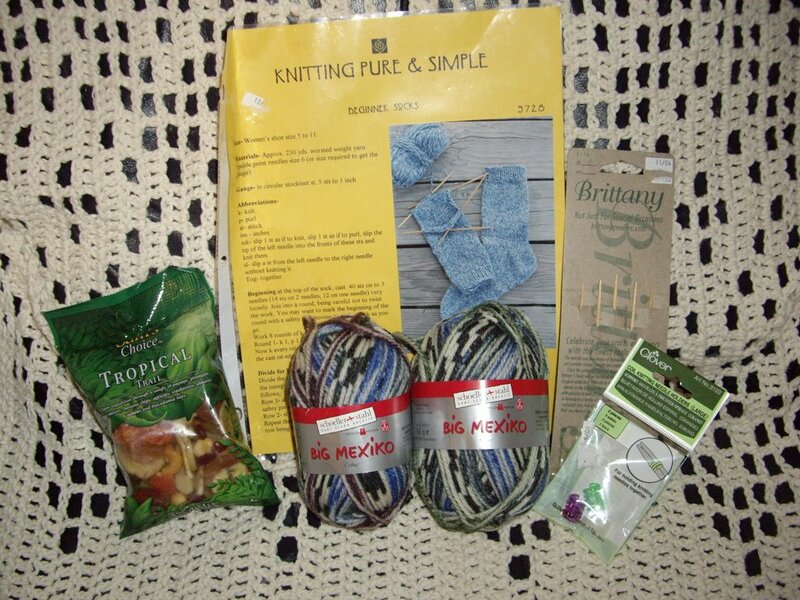 My secret pal sent me a "Knitting Pure & Simple" pattern for beginner socks and superwash self-patterning sock yarn. Looks pretty sedate, huh? 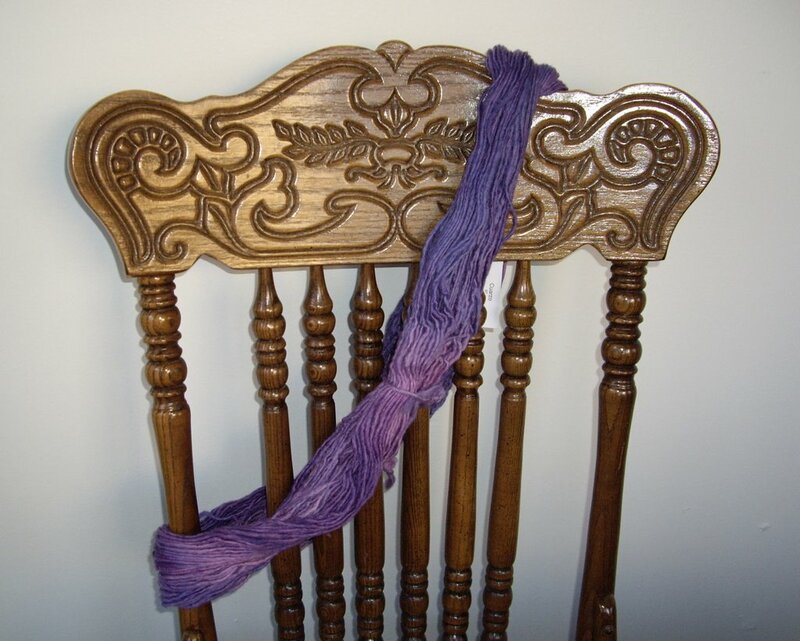 Blue, white, black, a little burgundy, and green are visible on the outside of the skein. But who knew what mysteries lay within? It's a veritable rainbow of colors! At my knitting group last night we all enjoyed seeing the colors that emerged. These are going to be very fun to wear with clogs (and probably a very plain outfit otherwise). 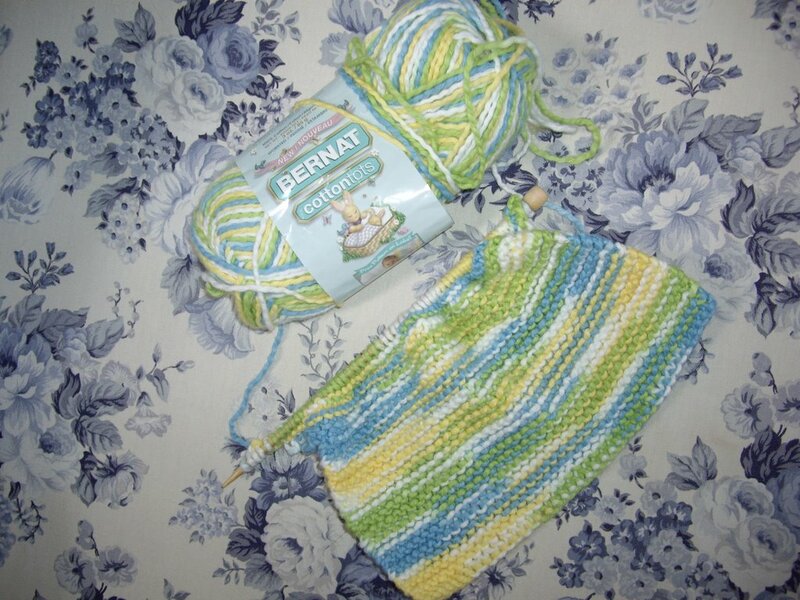 I just divided for the heel. 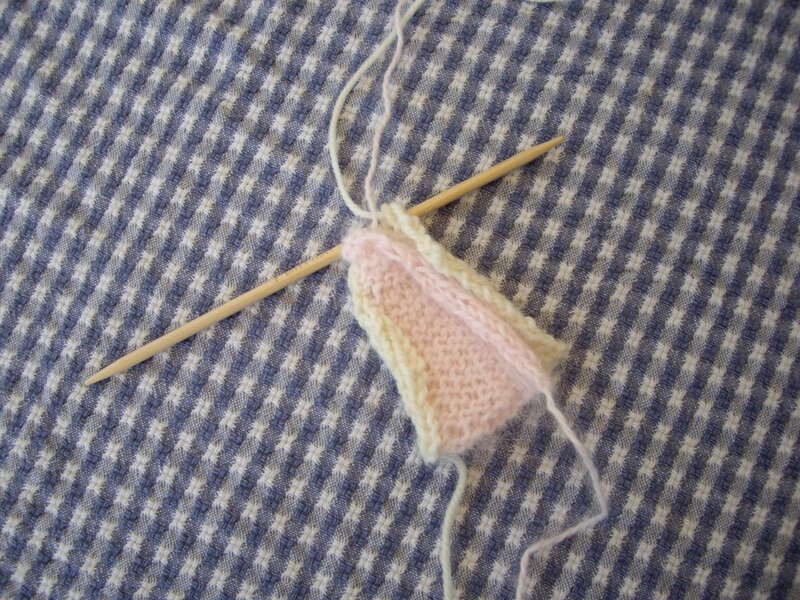 So far it's going pretty quickly, and I definitely can see the addictive appeal of sock-knitting. For those of you in the Chicago area, the DIY Trunk Show takes place this Saturday. As far as I can tell, it's a "hip" craft fair, kind of like the Renegade Craft Fair, but indoors. This will be my first time. I'm meeting up with some knitting group friends for brunch beforehand at Milk & Honey Cafe, a restaurant that I've been wanting to try for a long time. I'm also gearing up for my husband's birthday party tomorrow night. We're meeting friends for German food and beer at the local outpost of the Hofbrauhaus, then having birthday treats. 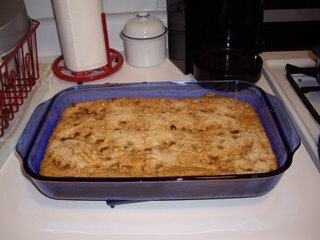 I just baked Paul's favorite butterscotch bars; brownies are on the agenda for tonight's baking, as well. I'm going to post the recipe for the butterscotch bars below, but consider yourself forewarned. The recipe is very easy, but it contains TONS of processed foods. So if you're a Whole Foods / slow food movement / organic food devotee, you're going to want to steer clear of this one. They're absolutely delicious, though! Preheat the oven to 350 degrees. Grease a 9 x 13 cake pan. Mix together the cake mix and the pudding, then mix in about half of the butterscotch chips. Spread the batter (which will be sticky) into the cake pan. Sprinkle with a little granulated sugar and the rest of the butterscotch chips. Bake 32-35 minutes. The show was great. 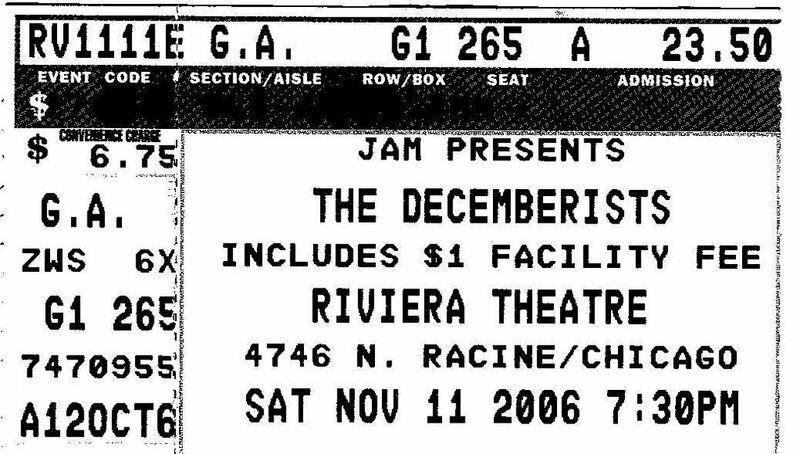 For those of you unfamiliar with the Decemberists, they're an indie band with a unique, melodic sound. They wield a panopoly of instruments: cello, accordian, string bass, hurdy-gurdy, in addition to the usual suspects. 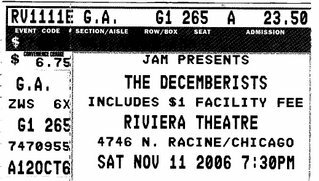 Lead singer Colin Meloy writes thoughtful lyrics, though he can also be very playful (e.g. "The Mariner's Revenge Song"). They played a bunch of songs off their new album, The Crane Wife, including a rousing rendition of "O, Valencia." The highlight for me, though, came near the beginning of the show: "The Engine Driver." So not much crafting took place, but my new blue bathroom looks lovely! Michelle at Overdue Books has conceived of a brilliant plan for this winter: the From the Stacks Winter Reading Challenge. 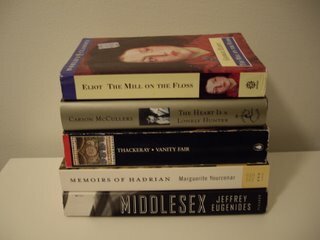 If you are anything like me your stack of purchased to-be-read books is teetering over. So for this challenge we would be reading 5 books that we have already purchased, have been meaning to get to, have been sitting on the nightstand and haven't read before. No going out and buying new books. No getting sidetracked by the lure of the holiday bookstore displays. The bonus would be that we would finally get to some of those titles (you know you picked them for a reason!) and we wouldn't be spending any extra money over the holidays. The time frame would be Nov. 1st until Jan. 30. 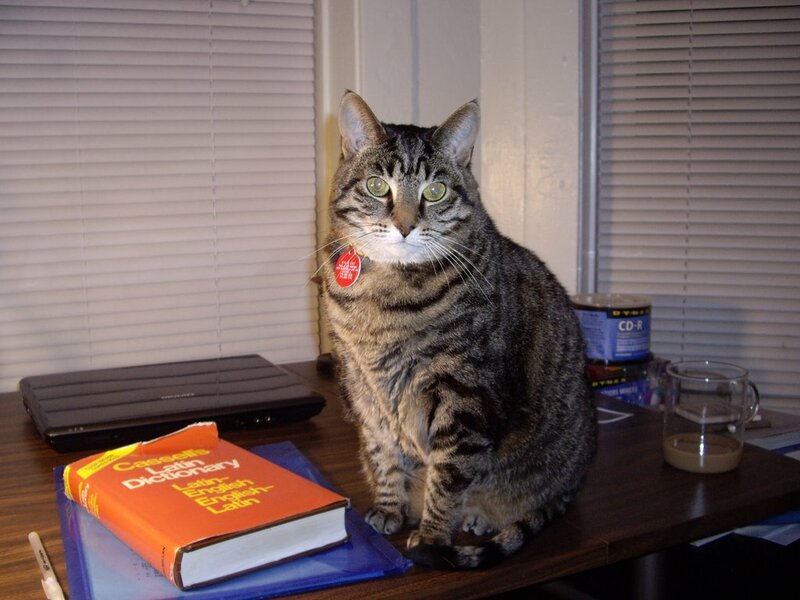 Kylie Cat thinks it a marvelous scheme, for she is a very literary feline, naturally. I "felted up" two Booga Bags on Tuesday night. They are happily drying away near the radiator. On the subject of radiators, it has been unseasonably warm here in Chicago. I rarely check the weather reports, so I was in for quite the surprise yesterday. I bundled up in a wonderfully soft hooded lambswool/ angora/ alpaca/ cashmere blend sweater for a 65 degree day! To make matters worse, the radiator in my office was going full blast all day, creating quite the steamy atmosphere. Have you heard what month it is? It's Norovember! 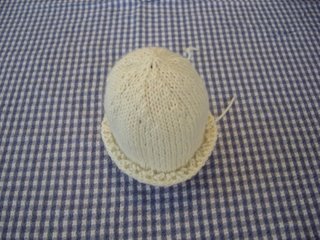 Check out the informal knitalong here. 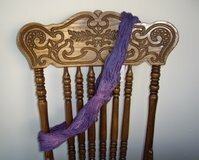 - Pie Knits' Grape Hyacinth Lace Scarf. Thanks again for the pattern, secret pal! 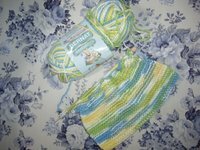 - Kureyon striped tea cozy. I can't let my tea get cold while I'm making my way through that tea stash this winter. 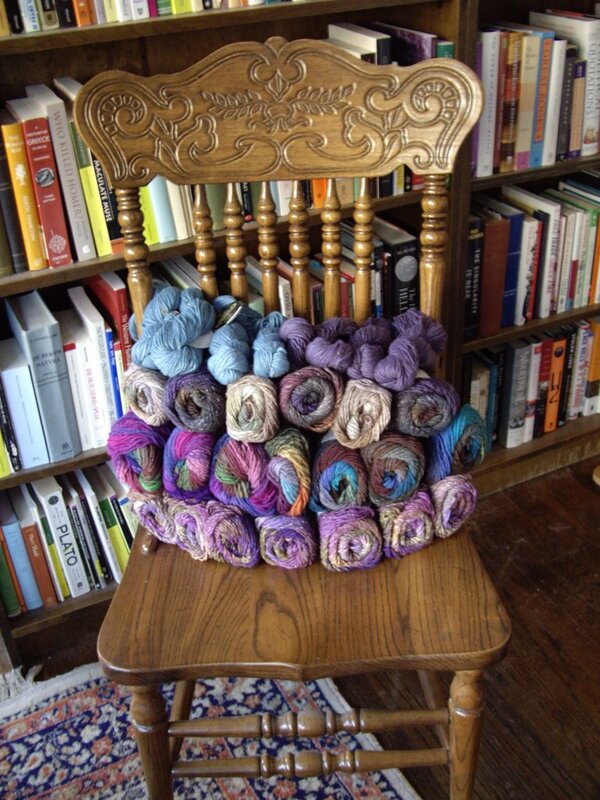 This Lady Eleanor is the most beautiful Noro project that I have seen lately. Simply gorgeous! It looks cozy, substantial, and luxurious. 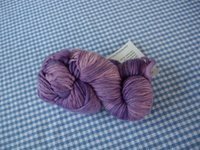 In other knitting news, the long-awaited and much-anticipated Malabrigo shipment was a bust. Apparently Cuarzo is not the color for me. It reminds me of unicorns, My Little Ponies, and Barbie dolls, a chapter of my life I left behind long ago. 1) The knitting gods must be conspiring against me. 2) There's a reason why I almost always choose blue. 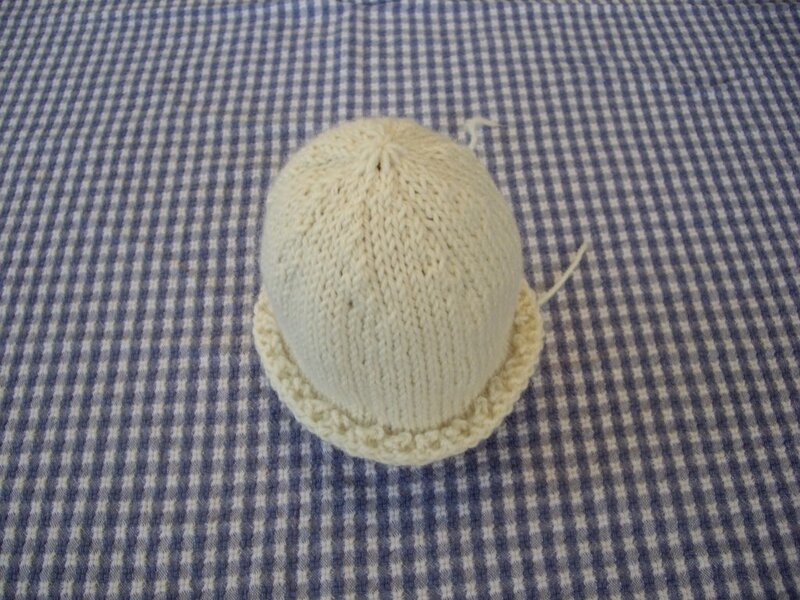 Finally I had a chance to catch my breath and knit a little. 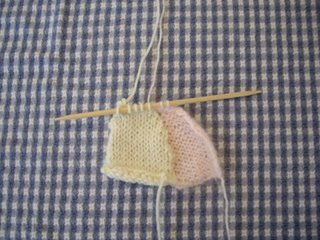 While I was at the basketball game last night I kept thinking that I would much rather be at home with a cup of tea, a good book, and some knitting. It was a dull game, especially bad if you're a Milwaukee Bucks fan, as my husband is. 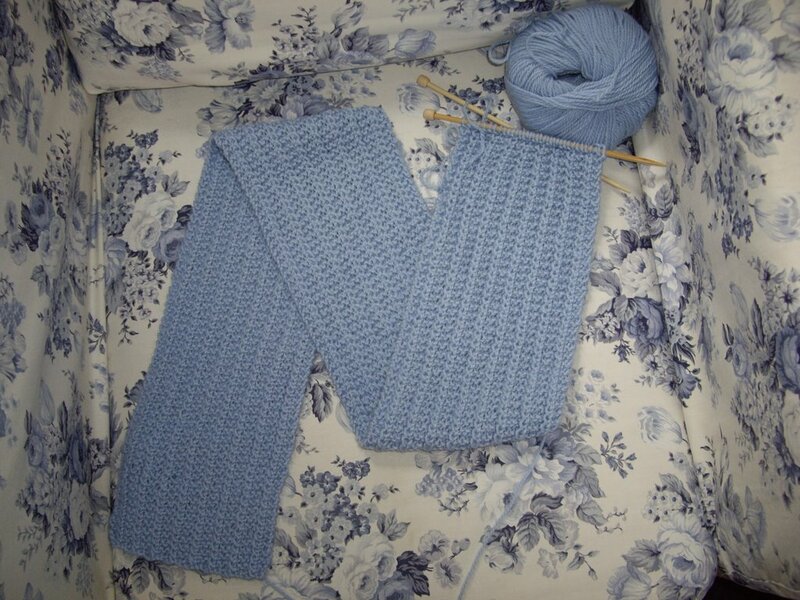 The light blue scarf is coming along quite nicely, and I'm excited to start Grumperina's Odessa hat to match. These accessories will coordinate fabulously with my light blue and grey North Face ski jacket. 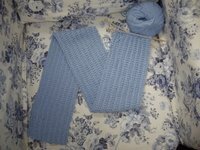 The baby kimono works much better in garter stitch. I need to pick up some more size 6 needles to keep going. My short little bamboo straights aren't long enough to hold the sleeves. HOARDING! Here you see about 5.5 years of Cooking Light, 6 months of Rachael Ray magazines, back issues of Penzey's spice catalog (they put great recipes in there), and the random issue of Bon Appetit or Gourmet. The bookcase is pretty much full, so there's no room for these. What to do? I just don't know. I should probably toss all the Cooking Light issues since they have a great website with recipe archives for subscribers. But what if I want to browse? Do I really need to keep subscribing? If I don't renew my subscription, I won't have access to the recipe archives. So maybe I should hang on to the magazines? 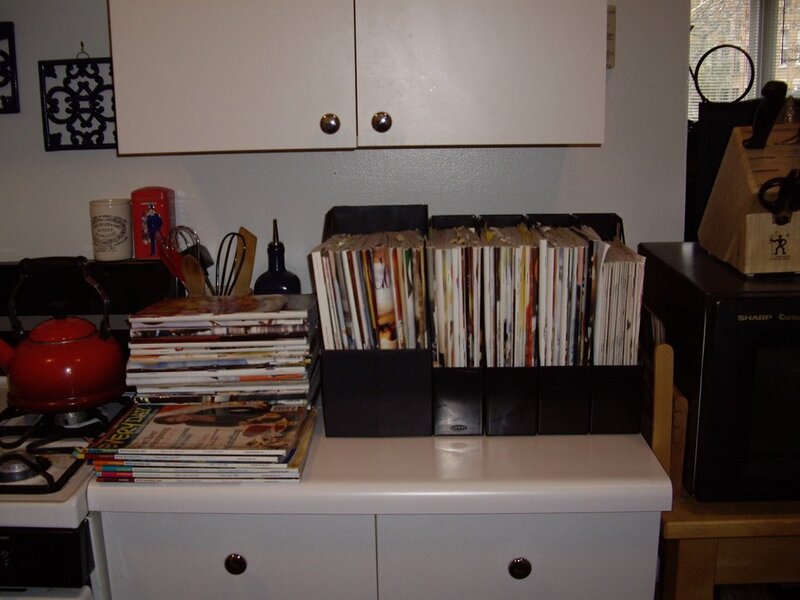 All you organized people who cut out the recipes you want to try each month and put them in organized little binders are snickering at me right now. That's a great system, but I'm just not that disciplined. Any and all suggestions are welcome here. I'm making a concerted effort to drink lots of tea and invite friends over for tea in an attempt to whittle down the stash. 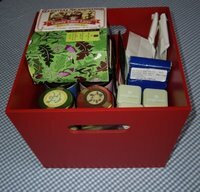 I like to try new teas, but I also like to have old favorites on hand. The past week has been a whirlwind. Holding extra office hours, grading midterms, dealing with my mother's health problems -- all of these things have been mixed in with movies, pints of Strongbow at the pub, lunch with a dear friend, and a trip to the ballet. Needless to say, not too much crafting has taken place. 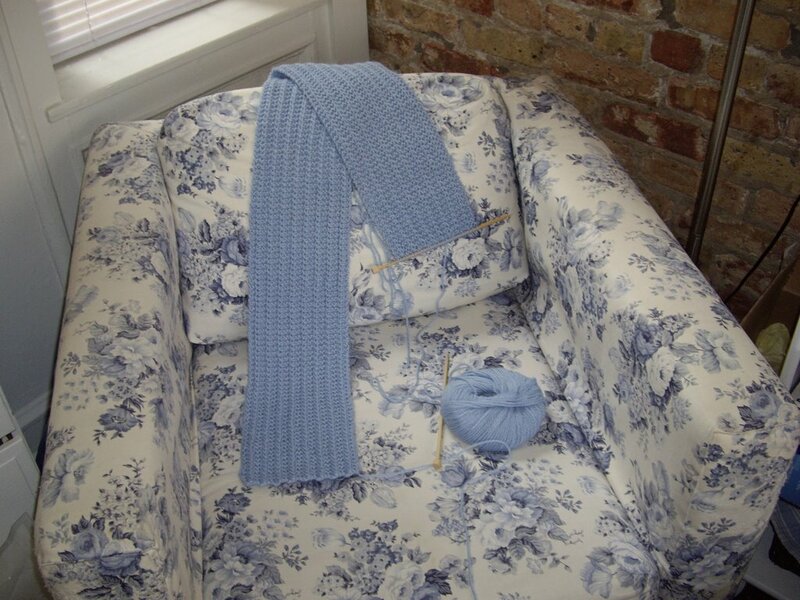 I have been scoping out ideas for holiday ornaments to make, and I have been knitting away on my light blue scarf. I'm anxiously awaiting the arrival of my WEBS order (Hourglass, here I come) and the Winter 2006 issue of Interweave Knits. Beautiful costumes, beautiful dancing, but not too much feeling. The cinematography is interesting, especially the mixture of sharp focus and blurriness, and Edward Norton does an admirable job in his role. I found it awfully predictable, though. My main impression is that the crack squad behind this one skimmed "The World of Wonders" in Robertson Davies' Deptford Trilogy, then watched The Usual Suspects a few times. They definitely underestimated the intelligence of their audience. I actually fell asleep in the theater for part of the second half. - lunch at Panes Bread Cafe at Sheffield and Wellington here in Chicago. Delicious! 'Nuff said. Paul was craving meat after a couple weeks of beans and vegetarian delights, so we gave this recipe a try. They came out well, but a bit dry, and I would add a couple things next time. - This is the cutest thing I have EVER seen. I'm off to the Bulls vs. Bucks game tonight, then there's a mountain of quizzes to grade. this quiz was made by Lori Fury Warning: there are a few racy questions in this quiz. Last night Paul and I made one of our favorite recipes. It's easy, it's quick, and it always turns out great. What more could you ask for? 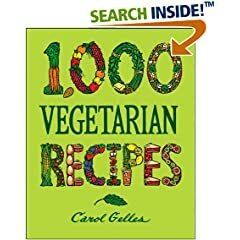 It's from Carol Gelles's 1,000 Vegetarian Recipes. This is a great cookbook even for non-vegetarians. It won a James Beard award, as well as a Julia Child award. It emphasizes whole grains and vegetables, but not in a preachy way, and it includes a wide array of dishes and cuisines. I own PLENTY of vegetarian cookbooks, and this is one of the best. Runners up include Moosewood Restaurant Cooks at Home and Main-Course Vegetarian Pleasures. 1. In a 2-qt. saucepan, heat the oil over medium-high heat. Add the onions and garlic; cook, stirring, until softened, about 2 minutes. 2. Add the tomatoes and break them up with the back of a spoon. Stir in the vodka, tomato paste, sugar, salt, and red pepper. Cook, uncovered, over medium heat 20 minutes, stirring occasionally. 3. While the sauce is cooking, cook the pasta according to package directions; drain. 4. Stir the cream into the sauce; cook, stirring, until heated through. Do not allow to boil. Pour sauce over pasta and toss. Stir in 1/4 to 1/3 C. grated Parmesan cheese when you add the cream. Shockingly enough, I prefer not to add the cheese. I found a wonderful package at my door when I arrived home yesterday. My secret pal sent me the pattern for beginner socks (perfect for me!) 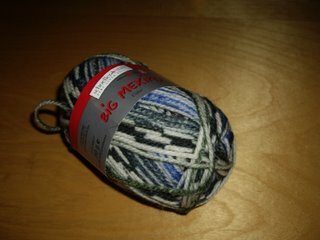 and superwash wool sock yarn, "Big Mexiko" in a great self-patterning colorway. There's also tropical trail mix that will make for some yummy snacking, Brittany (luxurious!) size 1 DPNs for a fair isle mitten project that I have in mind, and needle keepers. Everything was so thoughtful, and I am oh-so-pleased! I sent my secret pal a package over a week ago, but I haven't heard any feedback yet. Hopefully the USPS didn't lose it. Paul and I finally succumbed and got cable TV. Our TV reception has been absolutely horrible for 2 years, so that's the real attraction. It has been at least 5 years since I've had cable, and I was a little afraid that it would be addicting. That doesn't seem to be the case, though, 'cause there's still not much I would like to watch! I may have to add BBC America to the lineup to make up for all that ESPN Paul will be watching. 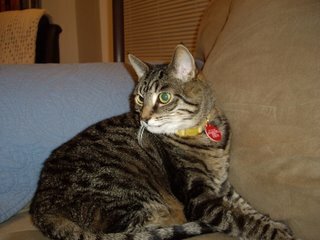 Kylie is very happy about the increased potential for TV watching and cat snuggling this winter. 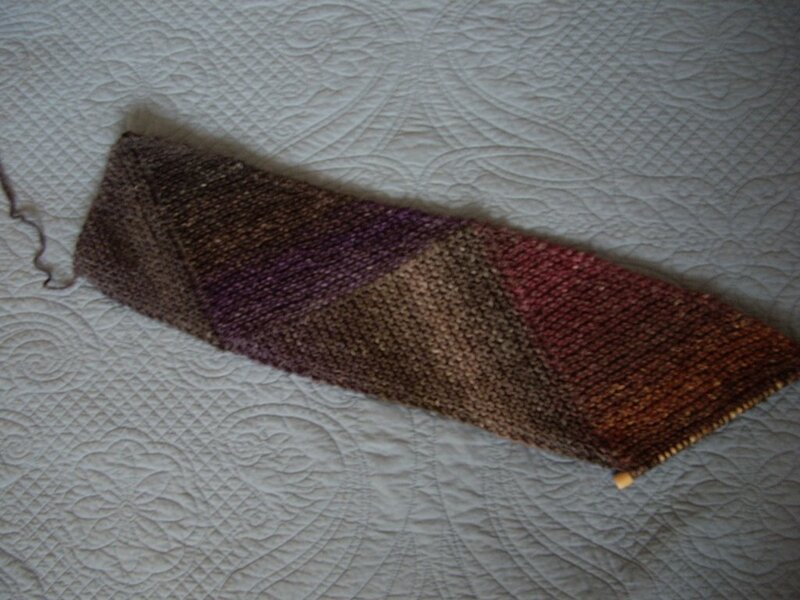 I ordered Malabrigo to knit the Hourglass Sweater from Last-Minute Knitted Gifts. 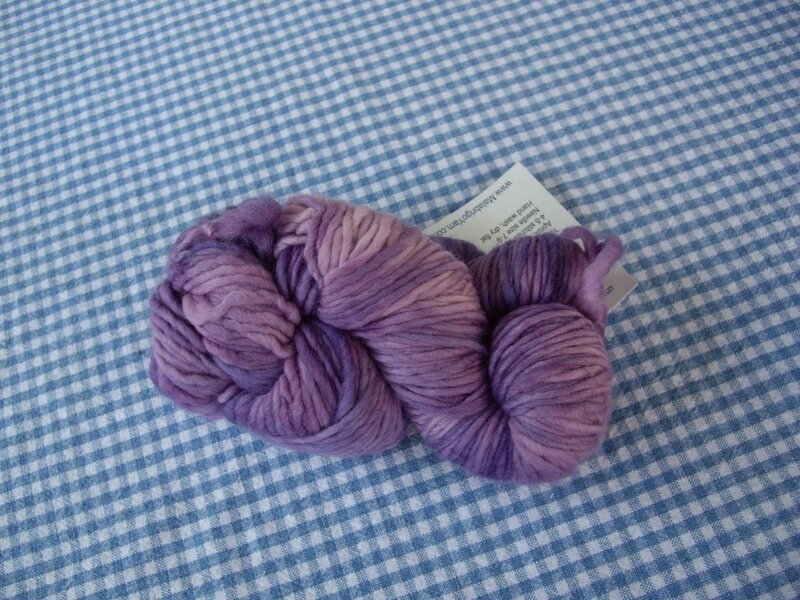 After much indecision, I went with Cuarzo, a lovely blend of lavenders and purples. 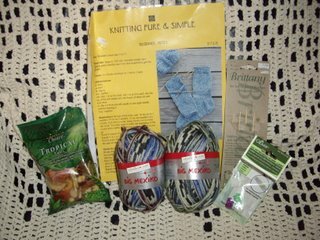 I had a hard time finding stores that had enough yarn in stock in my first few choices (violetas, jewel blue, indigo), and perhaps I already have plenty of blue yarn and blue sweaters already. Hopefully my order arrives quickly! 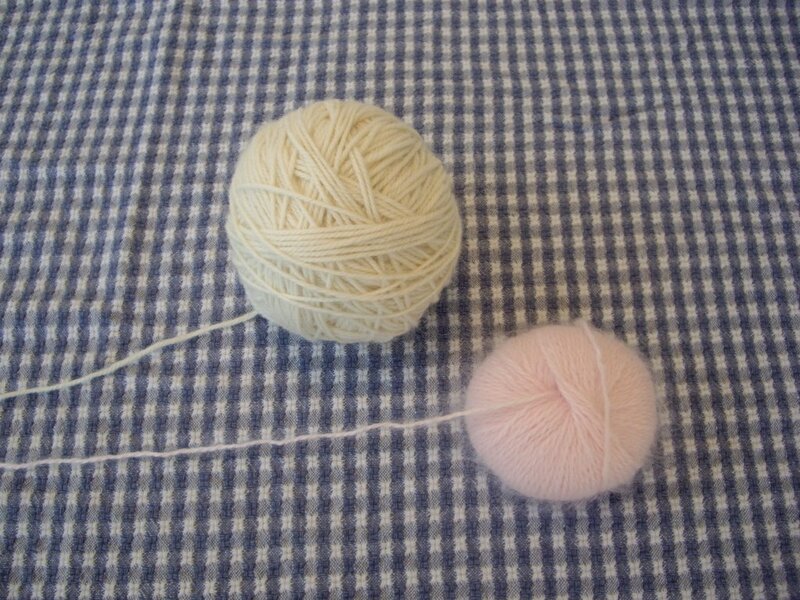 Has anyone out there used O-Wool (by the Vermont Organic Fiber Company)? How scratchy is it? The colors are beautiful and I love that it's organic, but I couldn't find many reviews or opinions of it. 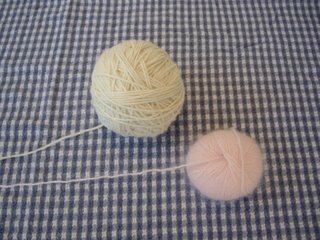 Likewise, how about Nature's Palette worsted weight wool? I know it bleeds b/c it's plant-dyed, but that's about it. My tea swap pal sent me some gorgeous Dancing Leaf Farm Rhumba Organic Wool last month, and it's plenty soft, so I have high hopes for other organic wools as well. 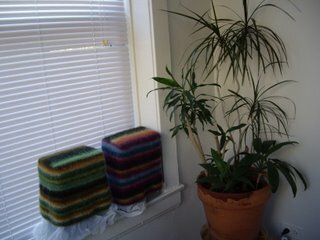 The Rhumba is variegated and a little too pricey for a whole sweater, but it will make some fabulous winter accessories. BTW, check out the mitred Silk Garden mittens at Zimmermania. To die for, and they would look great with a Silk Garden MD scarf!